Piper is our swimmer dog. It just might be his all time favorite thing to do. It's too bad he doesn't get the opportunity to swim more often, but we do take him as much as we can. He took to the water naturally as a puppy. While I was a bit nervous when he was younger and swimming around in rivers and lakes, I quickly saw that he was a great swimmer and I didn't have much to worry about. We have, however, learned a thing or two in his 8 years about dogs and swimming. Be very careful if your dog is tied to a leash while swimming. We made the mistake early on of hooking Piper to a long rope so he couldn't go too far. What happened was he got all tangled in the rope and had a lot of trouble actually swimming. I think back and wonder what we were thinking back then, but I guess hindsight is 20/20. You live and learn and thankfully we did not have a tragedy. Piper does not come when called every single time, so one of our worries is he will not come back. We now used a retractable extend leash if we have to hook him. I think I would rather chase him around than have him drown because of being tangled in leash. 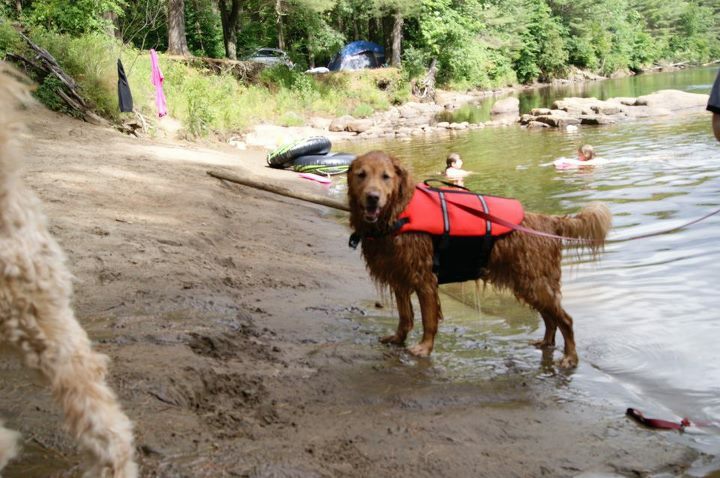 Buying a dog life jacket was one of our best ideas we have ever had. Piper is a large Golden Retriever (xxl maybe) and I get concerned that he will not judge how far he is swimming and tire out before he can reach ground again. His life jacket completely relieves that worry for me. 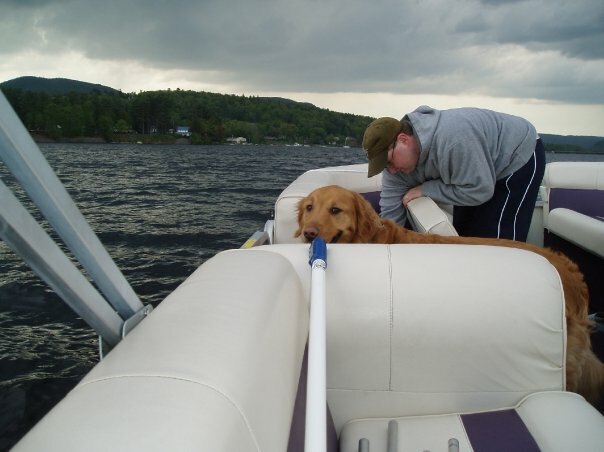 We owned a boat for a few years and Piper's paws never even touched the dock out to the boat without his life jacket on! We no longer own a boat, but when we did, Murray was a baby. We did have a puppy life jacket for him too, just in case. One of our first boat trips I am convinced Piper's life jacket saved his life. We encouraged him into the lake off the boat to take one of his such loved swims. 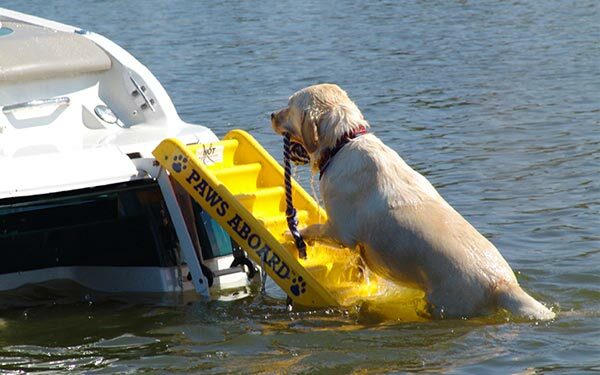 We had purchased a doggie boat ramp so he could easily get back into the boat. What we didn't expect was the dog ramp did not support him. Even though it claimed it would, I doubt it would have supported the smallest of dogs. So, we were in a panic about how to get Piper out of the water and back into the boat. We also had the rope attached and he was quickly getting tangled (stupid stupid stupid). It was a mess! The only thing that saved this situation was the life jacket. Jamie was able to lift his wet 100 lbs. out of the water and onto the dry boat with the handle on top of the life jacket. It wasn't easy, but it worked. We next upgraded from the boat doggie ramp to better made dog boat steps. I can't say Piper ever officially used them before we sold the boat, as we did not encourage him swimming from the boat out in the lake again, but we had the steps just in case he did go in, accidentally or not. I highly recommend them for any boat people with dogs or anyone who has a dog that swims from a dock. I have seen large dogs use them quite easily. One unpleasant side effect from swimming in lakes and rivers is that Piper has come down with some intestinal type infections from gulping/drinking the water from time to time. We try to be diligent about stopping him from doing this, but it doesn't work 100% of the time. His symptoms were loss of appetite, vomiting and/or diarrhea. Just something to be watchful over if your dogs do a lot of lake and river swimming. We currently have an above ground pool we do not allow our dogs to get in. Piper cannot stand that he lives this close to water and can't go in! We have a deck with a safety gate, and good thing, because I am not sure Piper wouldn't take the plunge given the opportunity. We have started to allow them on the deck while us humans are in the pool. We have pool steps and not a ladder which I think would be doable for Piper to get out of the pool should he get in. We do keep a baby type gate on the deck in case we want an extra barrier between him and the pool when he's on the deck watching us anxiously. I haven't mentioned much about Murray in this post because he is not a water lover. He likes his feet to stay firmly on the ground and most of his body dry. While he is fairly careful around water himself, we take a few precautions with him as well. We are careful if we know water is going to be deep enough that he would have to swim. We usually show him (as best we can) how deep water is by walking in ourselves. We never force him in the water, but we do encourage him bit by bit just to raise his comfort level. Maybe one day he'll swim! Misty the alpha Poodle is a total water dog. Our other Poodle doesn't even like morning dew. Go figure. My Dexter is crazy about swimming. I have to use a leash if I let him swim in a lake or a stream, but I am very mindful to keep it untangled. He goes in the pool next door, but learned early to use the stairs (in fact he won't even dive in from the side). Mango is not a water dog. No worries there. I think I am going to attempt to teach Murray...for his safety, if no other reason. If I can get past his pathetic sad face as I encourage him in LOL!